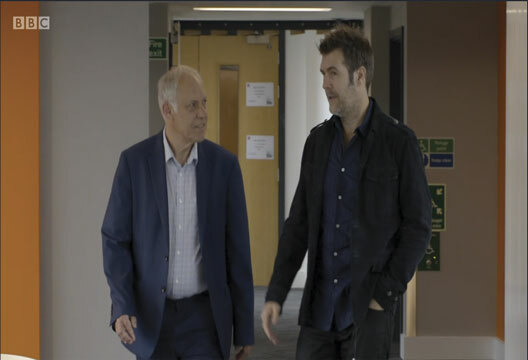 When I was invited by producers at BBC Wales to assist with making a television programme about Rhod Gilbert’s shyness I was intrigued. It was not so much that he’s a shy person who is also a stand-up comedian and television personality – it is not uncommon for public performers to be privately shy. It was more how they would make a successful programme about shyness. I met Rhod for the first time in Cardiff University, where we were filmed discussing shyness for more than an hour, covering psychological research into social anxieties as well as his own experience. He is a sociable and witty man yet still finds many mundane tasks (such as eating in public) difficult. He recalls not leaving his room for days when he started university. His shyness continues to dog him but has never affected his stage performances. Like many shy people he finds that not everyone he knows considers him to be shy; in an amusing episode in the programme, his fellow comedian Greg Davies believed that he had been invited to participate in the programme because of his shyness, not Rhod’s; neither believed the other to be shy. The film took shape over the next months. The first half deals with Rhod’s exploration of his own shyness and the nature of shyness, including asking members of the public in a shopping centre whether they consider themselves to be shy. Many do, as previous survey research has found. In the second half, Rhod encourages three shy novices to prepare and eventually deliver a stand-up routine to an audience in a comedy club in downtown Cardiff. All three successfully do so. The film movingly captures something of the palpable nervousness and relief that Rhod and the audience, including me, experienced – as well as the fear and courage of the performers. I believe they benefited greatly from tackling this challenge. Perhaps, too, making the programme helped Rhod to embrace his own shyness, an aspiration for him that his wife expresses in the film. I think that viewers will take away from the programme that social anxieties are common; that people who consider themselves to be shy are not alone in this experience; that other people are less censorious than they imagine them to be; and that the self-consciousness, anxious symptoms and inhibited behaviours that characterise shyness to various degrees can be negotiated with the help of encouragement and empathetic support.